The Joyful Hermit is asked to contribute a food item for a funeral dinner. Such a fruitful way to help the grieving, and Joyful ponders the full effect of the project. Given several options, JH settles upon a fruit salad; strawberries are on sale for $1 per pound-container this week at the grocery. 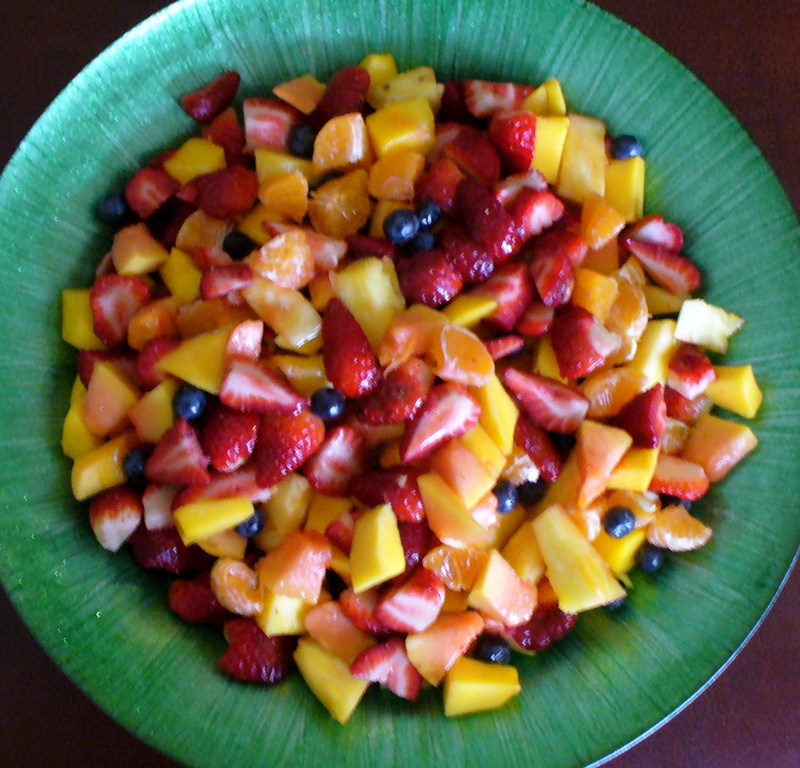 Fruit salads can be quite cheering. This offering for a funeral dinner keeps health in mind and also gives soothing effects of sweetness. The ingredients consist in whatever fruit is on sale with the exception of a pint of choice blueberries costing $2.99. The papaya and mangoes, the pineapple and strawberries– even the clementines–are sale priced. Joyful spies a coupon in a couple containers of clementines, so makes sure to get one of those and utilizes the added 75¢ savings. Besides quantity, quality and color combination of fruit, a vital consideration is presentation. Joyful Hermit has no bowl large enough other than a tangerine-colored pottery that easily chips, and worse, the color will not vivify the fruit. Why not have this dazzling, healthy, succulent fruit reveal its hopeful glory to best effect? JH drives on to TJMaxx to see what the clearance aisle might contribute for this cause. Yes, funeral dinners are a loving cause. A human being lived an earthly life, now concluded, but in faith, hope and love lives on anew in spirit. Family and friends return from the cemetery to gather their memories and emotions in the presence of, hopefully, good food beautifully presented as gifts of sustenance, sympathy and love. The blues and greens in the bowl shimmer glints of gold in certain light. Some say the color green symbolizes peace; but virtuously, green is the color of hope. 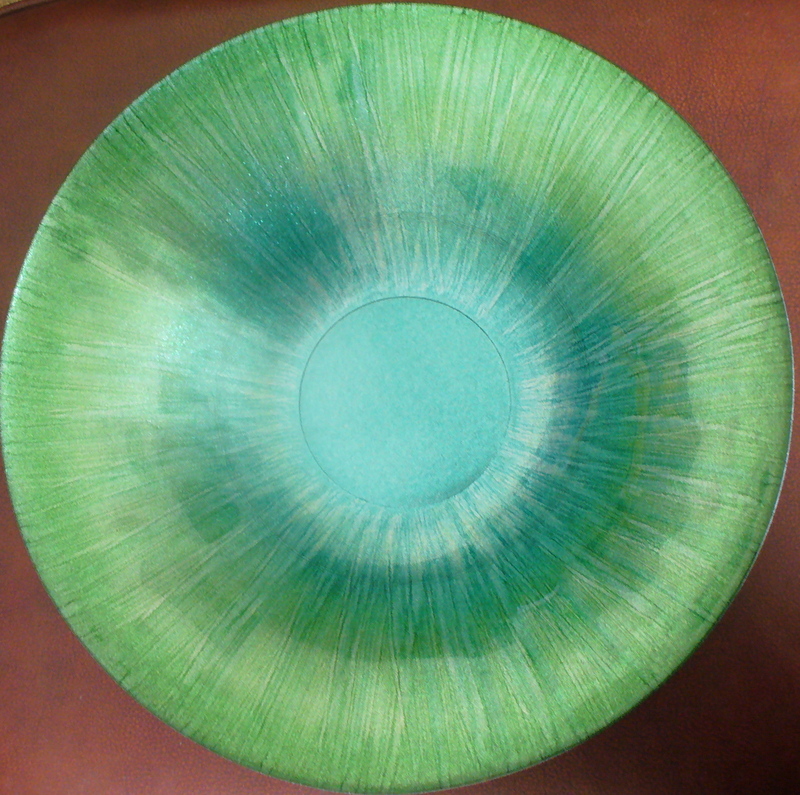 The living uniqueness of the hand-crafted bowl lends perfectly to what Joyful hopes will be oft-used for funeral dinners, offering various types of salads. This Tuscan bowl has superior constructive qualities than the pressed-glass; it should serve many grieving souls. Consider, too, the statement it makes in hopeful hues no matter the salad within! Plus, all is a donation tax write-off: miles driven to stores and Church, fruit purchases, and cost of the bowls which will have years of funeral dinner and other uses. Joyful Hermit spends the morning washing, peeling, chopping and arranging fruit–all the while praying for the soul who lived, died, and lives yet still…and for the family and friends. Count it all joy! This entry was posted in Cost Savers, Living Holy, Recipes, Spirit Lifters. Bookmark the permalink. love this! beautiful tjmaxx find! job well done. Joe and I were recently talking about a talk he heard and the priest was speaking about the works of mercy….and said that he sometimes feels like Jesus is going to come out of the tabernacle and say “go DO something”…. anyway…your work of mercy just reminded me of that..
the importance of an active faith…. Thanks. You do so much for all the souls, living and dead and alive again! Such a loving, beautiful wife and mother. poverty in the effort. Just a small drop of energy out in the cybersphere of people and ideas. But will be omnia pro Deo….